Published by Young Zubaan & Puffin books. Ages 6+ read aloud, 9+ read alone. Image: Courtesy Penguin books India. We were city dwellers as children, and would visit our native town during summer vacations. Those were carefree days, when all we did was eat, sleep and play. Although trucks, cars, two-wheelers, and cattle are seen all-together on our city roads too, the mix is more eclectic even today in small towns and villages. Travelling to this place was an adventure in itself. Roads in the 70s and 80s were terrible and travelling on these by a bus always a very bumpy affair. My memories of the town itself is of a bustling place, very dusty, noisy and crowded. At least the bus-station and market place was. There were shops selling every variety of stuff-- vegetables, steel shops, sweet-meat sellers, shops of clothes. Cows, chewing cud, chose to stand right in the middle of busy streets, and no amount of honking at them disturbed their placidity. Where there were trees, there were plenty of birds and monkeys creating a racket. Sometimes a lone monkey or a group of them tried to steal food from some unattended stall, leading to a chase with whatever the stall owner found at hand to throw at the monkeys to scare them away. One does come across such towns many times during one's travels around India. These towns are quintessentially the same with minor variations of language or the dressing style particular to the region. 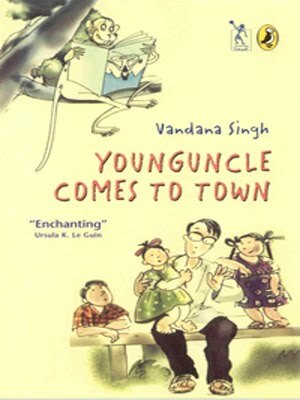 Vandana Singh's book is placed in one such un-named town in North India. The flavour of the town has been brought forth with her effortless story-telling. It is an unobtrusive but unmistakable character in the book. Younguncle is everyone's dream uncle, with the somewhat unusual name. Legend has it that he had been kidnapped by monkeys in his childhood, tossed around by them, but returned unharmed. Everyone loves him, and when he comes to our town to stay with Sarita (age 9), Ravi (age 7) and the baby, things begin to happen. He is enterprising, intrepid and a wonderful story-teller. There never is a dull moment with him around. Whether it is when he tries to hold down a job and cannot because he "took his jobs too seriously." Whether it was when he got a former-pickpocket-now-in-a-honest-trade to help him outwit the real pickpocketeers from troubling the people at the railway station. Whether it was when he helped his unmarried sister get out of a boring matrimonial alliance without actually seeming to do anything about it. Whether it was when he helped the local milkman Ramu get his beloved cow Janaki, back from the clutches of the henchmen of the dreaded landlord Gobarmal, by using the unwitting help of the monkeys on the trees. Whether it was helping his Ancient Uncle get his prize horse Hira, back from the clutches of the same Gobarmal, freeing the local bus-driver's beloved Renu from slavery at Gobarmal's place at the same time, and playing Cupid. Whether it was helping the ghost in the tree, Bakvaasnath, get back at the landlord Gobarmal, whose forefathers had swindled him of his money. And the most unbelievable escapade of all, one which requires a bit of suspension of disbelief from us--when he overpowers the old tiger in the sanctuary by gaining its trust by feeding it...hold your breath...palak paneer, rice pilaf, chicken curry, mutton curry and parathas, and gets its tail-hair for the baby who has asked for it as a present! The characters also have wonderful names. Gobarmal is the dreaded landlord. "Gobar" in Hindi means cowdung. Bakvaasnath is the ghost on the tree who keeps wailing "Giiiive me myyy money!" "Bakvaas" in Hindi means nonsense. We also have a monkey who wears Younguncle's shirt and tries to read his book upside down, the baby whose mission it is in life to eat Younguncle's shirt, the love-lorn local bus driver who 'drives like a maniac' on bumpy roads and is looking for his lost lady-love, a busful of people who try to set up Younguncle's matrimonial alliance with a fellow-traveller's marriageable daughter, and Ancient Aunty who tries to bully Ancient Uncle. A lovable bunch. You will have to read how all this comes about in Vandana Singh's delightful book. The book lends itself wonderfully to reading aloud. We had a lot of giggles and belly-shaking laughter at home while reading it. With many discussions about how things were in the days when I was a young child. The book has this said by none other than Ursula K Le Guin, "Enchanting." That should say it all! Should definitely pick this up. Thanks sandhya. This and Younguncle in the Himalayas count among my all time favorite reads. Always leave me wishing for one more book in the series! Thanks, Satish, Anu. You must try this one. @Nitya: Just picked up Younguncle in the Himalayas from the library yesterday. Looking forward to reading it. I loved the baby's mission - to eat at least one of young uncle's shirts. @utbt: Oh, yes, the sister-in-law who speaks in capitals. How can I forget her. I have been reading the next book in the series and loved her there too. But that is for another post. Hot in these parts, this one is! I've just finished Younguncle in the Himalayas and really enjoy its humour and setting - definitely one I'll be suggesting to young chapter book readers. Unfortunatately my library system only has this Younguncle book and not Younguncle comes to town. Hopefully one day I'll be able to find a copy of it.